Cupcakes - those tempting little cakes that send icing to slowly cascade down their tops in a way that begs fingers to scoop and be licked, tongues to circle around and gather the excess along the corrugated terrain of the wrapper. The paper is seductively peeled back to reveal a moist cake, in this case flavoured with Meyer lemon and slightly perfumed with fennel tea - an excellent match. Meyer lemons are a new ingredient to me, and I was thrilled to discover bags of them in stock both at my local grocery store and the neighbourhood green-grocers. 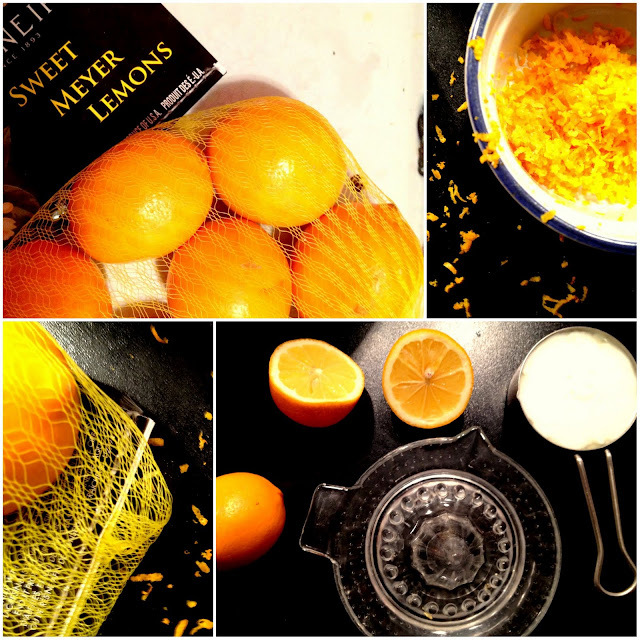 Meyer lemons are sweet, like an orange, with less of that acidic tartness other lemons have. Inspired by a few tea-infused desserts I've read about lately, I wanted to marry my favourite herbal brew with the sweet indulgence of a citrus cupcake. To start, I made a pot of fennel tea, using three bags and about 1 cup of boiling water. I let it sit to steep for quite a while to get all licorice-y and naturally sweet. I then made a simple syrup using 2 parts sugar to one part tea and boiled it to a thick syrupy consistency. I made a larger batch, as I wanted to use the rest to make sweet fennel iced tea (simply add water and ice to taste! You can store the syrup in a mason jar or any container with a lid in the fridge). I was also thinking it would taste great as the sweet component of a homemade cocktail (perhaps with a squeeze of Meyer lemon and Prosecco?) but have yet to try that. For the cupcake batter, I used my favourite birthday cake recipe from Anna Olson and altered it to accommodate the citrus flavours by adding both the juice and the zest of the Meyer lemons. The key to achieving that perfect cupcake crumb is allowing all your ingredients to come to room temperature before combining. This step allows any inherent flavours to awaken and aids any chemical processes to do their thing effectively when the mixing starts. Using an ice cream scoop to evenly distribute muffin and cupcake batters (cookies too!) works well - a trick I picked up when I worked in bakeries in my high school days. These cupcakes came out perfectly lemony and very, very sweet. If you like, you can lessen the amount of sugar in the recipe - I plan to next time. The frosting I used is cream-cheese based, but you can experiment with buttercream, meringue, a simple glaze, etc. - infuse it with the tea syrup and see what happens. The fennel flavour is subtle, but it's there. I included the contents of one of the teabags I used for the syrup in the frosting to boost the fennel flavour and add texture. Boil water and pour over tea bags to steep. The longer the better. Once well-steeped, combine 1/2 CUP steeped tea with 1 CUP sugar and let it come to a boil, stirring constantly until the sugar dissolves - around 5 minutes. Remove from heat. Do not let boil for much longer than this, or your syrup will thicken into candy, which is delicious, but not conducive to this recipe. If this happens (as it did to me), simply add a bit more liquid, and let it come to a boil and allow the thickened sugars to dissolve again. Keeps in a tightly sealed container in the fridge for about a month or so. Beat butter until fluffy with your stand mixer's paddle attachment, or with electric beaters on high. Add sugar and beat again until that mixture is fluffy. Beat in vanilla. Add eggs, one at a time, blending well to incorporate. Add zest, juice, and yogurt to combine. In a separate bowl, sift together dry ingredients. On a low speed, add the flour mixture, 1/4 cup at a time, alternating with the buttermilk and beating until the batter is smooth. 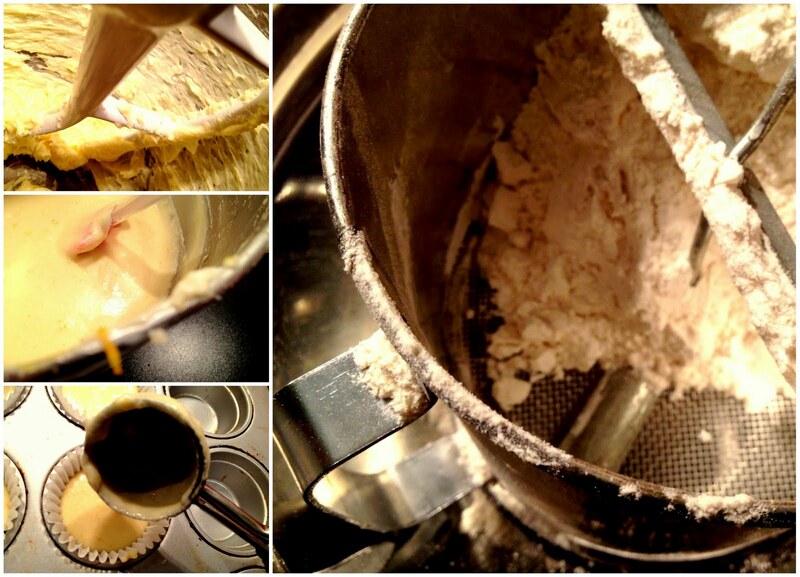 Using an ice cream scoop, evenly distribute the batter into a cupcake paper-lined muffin tin. Holding the tin level about one foot from your cleared table top or counter, allow to drop to dispel any bubbles. Bake on centre rack for about 25 minutes, or until a tester inserted in the middle of a cupcake comes out clean. With this recipe, do not wait for your tops to turn golden, as that is a sign they are over-baked. The cakes will be pale yellow and there will perhaps be a slightly golden ring around the tops - that is when they have reached perfection. It's my favourite! Tastes sort of like anise and is naturally sweet. I like cupcakes with lemon flavor.. These look lovely. I love fennel. I tried to make a green tea ice cream a few weeks ago and I burned it because I wasn't paying attention. I figure I'll wait a few weeks and then try cooking with tea again. Cheers! Thanks! I love fennel too. I've never made ice cream before (unless you count in kindergarten where you shake the ziploc bag) - I have been saving up for an attachment for my KA stand mixer though and when that day comes...fennel tea ice cream. It's happening.